How much was the bone? Denis and I went out the other night to an upscale supper club for dinner and to hear some live jazz music. I knew it wouldn’t be cheap but neither am I, so we saw the menu and the entrees were in the 20 and 30 dollar range. That seemed okay especially with live music. Our charming waitress went through the specials and highly recommended the bone-in filet. She said if we like steak, we should definitely try it. I like steak so I said okay, but I said it had to be well done for me. If it’s pink, I wouldn’t eat it. (don’t ask me how many chefs take umbrage with my steak orders!) I digress because the doneness was not the biggest problem. But it did arrive pink so I asked again for it well done. She said they may have to take it off the bone to make that happen and I said, “That’s okay, I wasn’t going to eat the bone.” So it finally came well done and it was okay, but not as lean as a filet should be. But the music was good and I wasn’t going to complain. Then the bill came. FIFTY-FOUR DOLLARS! Just for my steak! I put my glasses on. Maybe Denis couldn’t see in the dark and it was S4 for “Steak – cooked Four times as long.” No, it was fifty-four dollars! How much was the steak and how much was the bone? Now I had indigestion, not because of the food but because I felt conned. 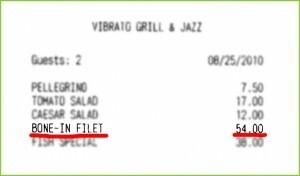 In a place like Vibrato Grill & Jazz, you don’t ask how much something costs – how tacky is that? I mean Jennifer Tilly was sitting behind us – this was no “eat it and beat it” joint. Herb Alpert owns it for God’s sake. If he was still alive, I would write to him. Oh… I think he is alive. But he wasn’t there. Maybe he can’t afford to eat there. ~~ Buy four filet mignons at Whole Foods and cook them on the grill. ~~ Fill up my car. ~~ See four movies with popcorn (the big buckets). ~~ Get two coffees at Starbucks. ~~ Get a Toblerone Bar from a hotel mini bar. ~~ Buy five skirts at the drug store. Sleeping in was not an option this morning. 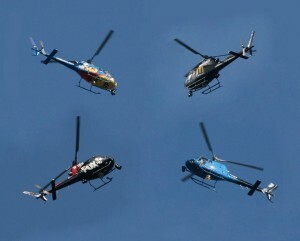 I was awakened early by a bunch of helicopters overhead, so I jumped out of bed hoping it wasn’t a fire. It wasn’t. 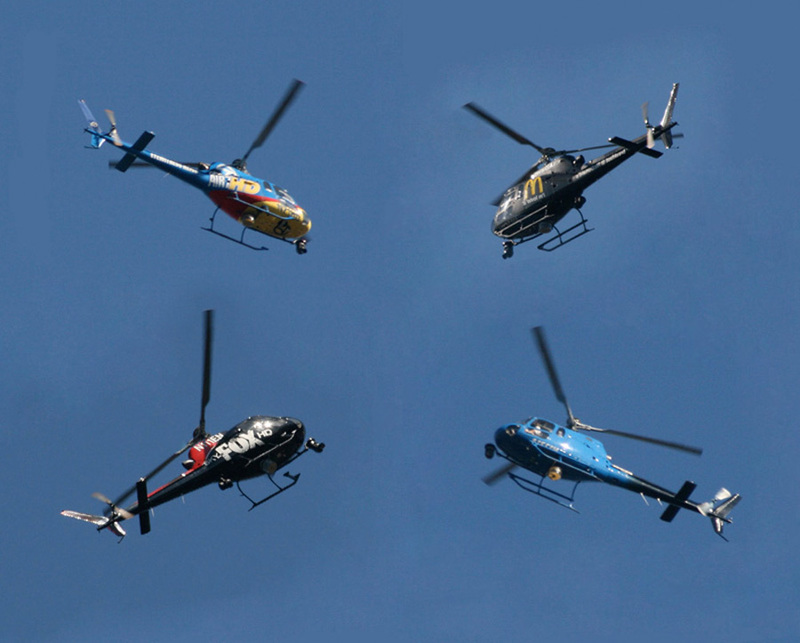 There were four news choppers in the sky and I wondered if Charlie Sheen’s car got stolen again and shoved off of Mulholland Drive. This was more serious. A knife-wielding intruder was arrested at Paris Hilton’s house at 6 a.m. this morning. It was all over the news so now even more people know where she lives. Her house is in a gated community with 24-hour guards and this wacko was pounding on the door trying to break in. How did he get in? If it were me, I’d have a meeting with the guards… to introduce them to the new guards. I was making rice pudding and watching the Miss Universe Pageant tonight when I felt a thump that sounded like something hit the side of the house. I turned on the outside lights to see if anything fell over but nothing seemed out of place. Then I saw the evening news and found out what it was. We had another earthquake. It was a magnitude 4.0 and it barely got mentioned on the news. Have we become so complacent here in southern California that teen texting was a bigger story than my thump? I wanted to know who else felt it, what fell down, who woke up, why it happened, when is the big one? “A 4.0 earthquake hit off the coast of Malibu at 10:45 this evening. And now, is your teen addicted to texting?” Whoa… hold on a minute! What about the big one? When is that happening? 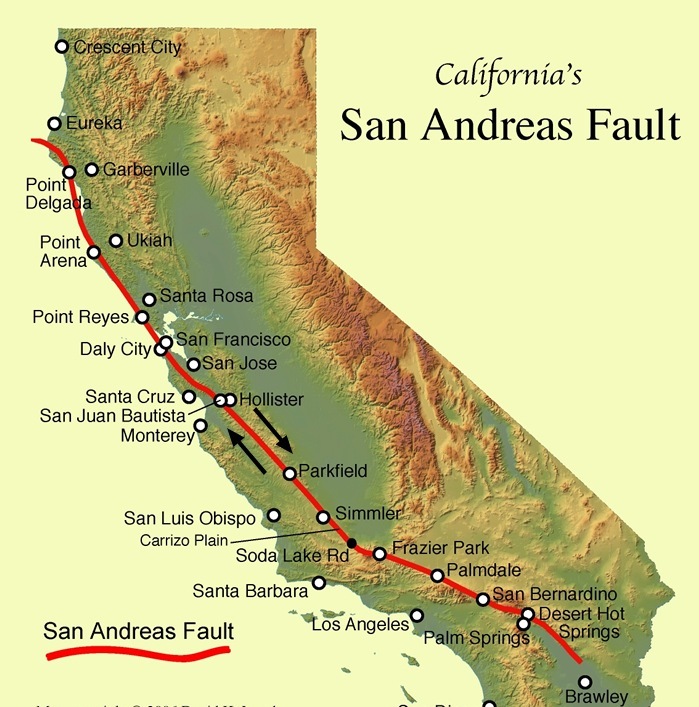 I just read in the L.A. Times that we are WAY overdue for a massive earthquake. It’s an article I wish I hadn’t read because they talked about liquefied soil and sinking trees and now I can’t sleep! And then this! 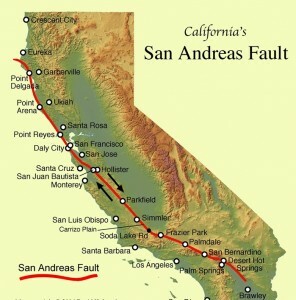 I just looked at the map of the San Andreas Fault and I live on the wrong side! 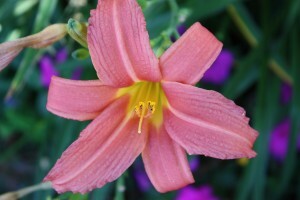 Here’s a daylily from my garden. We’re still in a heat wave so Denis and I went to the beach today. We decided to check out the new Santa Monica Place which just opened this month. It’s an outdoor mall right at the ocean. The best part is the food court on the third level with a huge seating area right over the water. There are two department stores, Bloomingdales and Nordstrom and lots restaurants, shops and entertainment. It’s a great destination and they have free valet parking for bikes! There’s also a huge central area for entertainment – we saw some hip hop dancers and cheerleaders. We had pizza, then came home and had pie. I made apple pie for Denis yesterday and he likes it so much he can never wait to have the first piece, but it has to cool first or the apples come spilling out. So I always put it on the cold granite counter to make it cool down faster. When that spot gets warm, we move the pie to a new cold spot, and we keep moving the pie around until it’s cold enough to eat. Denis says I make the best apple pie in the world. He doesn’t do a lot in the kitchen but he’s always willing to move the pie. “You have arrhythmia,” said the doctor. “I have what?” I was not expecting that sobering news. During my annual checkup last week, I was told that I have an irregular heartbeat (arrhythmia). Another reason I cancelled my mammogram last Monday is because I was wearing a heart monitor but I didn’t want to mention it until I knew more. It scared me at first but after an EKG, wearing a heart monitor for a couple of days, followed by an echocardiogram and two visits to a cardiologist, I’m told it’s not life threatening and it’s just something you live with. Sometimes, if I stand up too fast, I may feel a bit light-headed. (at least I can blame it on that) 🙂 So anyway, things are back to normal and I feel just fine. Imagine having a mammogram with that heart monitor on and they get the results: “Miss Jones, your stress level on the 16th was dangerously high. 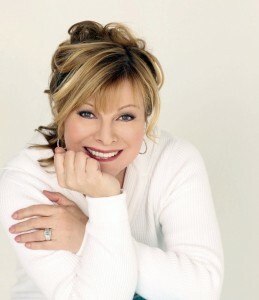 You need to make a serious lifestyle change!” Not to worry, it’s all good and I feel fine. 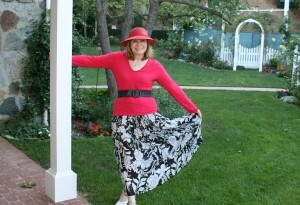 As promised, here’s a picture of my drug store skirt. My mammogram is re-scheduled for next week. Women need to kick other women in the behind. 2. I can’t find my shoes. 3. I’m still going to the bathroom. 4. That darn restraining order. 5. My car ran over some nails. Grocery shopping is something I enjoy. I find it relaxing to cruise up & down the aisles looking for new products and seeing what produce just came out. But it wasn’t fun today because I was forced to listen to an obnoxious, self-centered woman talking on her cell phone… did I say talking? I meant hollering into her cell phone. She sounded like Fran Drescher on crack. Let me put it this way: If the store was on fire and you had to alert everyone on the loud speaker to evacuate or die, she’d be the one to do it… without the loud speaker. Here’s what I was subjected to in the produce department: “Do you want me to get some wine? I don’t know, it doesn’t really matter. Do you want red? I guess white would be okay. Or maybe red would be better. Maybe we don’t need any wine. What are we going to be having? Red then? I don’t know. Maybe white. What? It doesn’t really matter, but if you want red then… blah, blAH, BLAH! !” I’m not kidding, did she have no idea the decibel level of her searing, grating, voice? I finally stopped, unable to focus on my melons, and gave her the evil eye. I’ll just stare her down and maybe she’ll get the message, I thought. No chance. She just glanced at me, oblivious to the gigantic sound waves emanating from her face, and kept yapping. I tried to escape to the fish department and guess who came around the corner? Princess Von Loudenheimer. I swear some of the frozen fish even woke up. I wanted to say “Shut your pie hole!” but that’s not my style. What a shame if her BMW accidently ran over a mysterious pile of nails. I only thought about it. Okay, I didn’t have any nails.